1. cease work or movement in order to relax, sleep, or recover strength. 2. be placed or supported so as to stay in a specified position. 3. (In Music) an interval of silence of a specified duration. I was saying how much I’m looking forward to the holidays – I’m a lover of this time of year, all things Solstice and the dead dark of the winter – and I began to notice how much I was craving rest. Proper, intentional, rest. 2016, for all it has been scolded for its disruptive, destructive madness, has been a year of more stability for me, personally. A new home. Proper holiday. A sense of family and community. New working partnerships. Interesting new clients and good work with existing ones… and still, I’m OK with it coming to a close. I’ve had the privilege of working with an eclectic mix of cultures in 2016, from Ballet Companies, to a European Motor Company; from start-up Research outfit to Fire and Financial Services (separate services for the record, just in case that reads badly). I know how I work defies the received wisdom about having a “niche” or a “thing”… which get a little tricky at times as folk try to place me – and the eclectic thing means I cross-pollinate learning solutions and cultural conversations as I go and that means I’m constantly learning…and that means my breadth and depth of subject matter itches are both scratched……..and it means I have to have more conversations about “fit” than I might otherwise need to have if I had a schtick… which is kind of hard work at times… and these are my choices and I like them…. What I’ve realised is, I’m in need of rest. Not oblivion. Not sprawling, vacantly staring, at the TV, flicking endlessly for “Something Good”. Not giving up and lying in a Spa for 2 days, whilst real life patiently waits in the car park to be dealt with… Not locking the doors and switching off the phone, battening down the hatches and running scared from the neighbours. For many of us, the concept of “rest” is an altruistic one, a much-sought holy grail. There is something of the “tomorrow” about it –it will never come. For me? It needs to be fought for. Rest in the sense I need it doesn’t mean dropping out and ignoring everyone and everything, only to find stuff still looms large later… it means some matters need to be attended to first, in order to carve out the rest space. For me, it means being able to rest within and alongside your life, learning where and how this is possible. It means allowing myself to be looked after (no easy feat for me) and relishing being allow to look after others. It might mean getting up before the rest of the house for a bit for some quiet time… it might mean sleeping in…. So the presents need buying and Christmas lights are up, the kitchen will have “store cupboard” stuff in so we don’t have to run to the supermarket every two minutes. The wine will be stocked. We know roughly who is where on what day… roughly… and space to Be is in there… and we just need to hold it… and that’s sometimes the tricky part. The house will be cleaned, tidied and cleared, with as little mania as we can muster – clean and tidy enough to be welcoming, not so much that it’s threatening etc. There’s a bad Christmas Playlist forming (including the much beloved 12 Hawaiian Days of Christmas “ Five big fat pigs/four flower leis/ three dried squid/ two coconut & one minor bird in one papaya tree” – I defy you not to giggle) There are loose plans – new Star Wars Movie, a Theatre trip, kids coming and going, walking off the Christmas pudding etc. At points, everyone being together in the same place will feel like a chore, no doubt – and then the trick will be to carve space for everyone to be Elsewhere or Otherwise Occupied for a bit. And at some point, having spent half an hour reading a book and then stomping up the hill with dog & humans in tow, knowing there is food ready on return and not really minding when we get back, I will feel that slightly melty feeling and know myself to be relaxing. I think rest these days is hard-fought for. I know it is worth the fight. To you and yours I wish you all the best for the Season & good rest, when the opportunity comes. I’m thinking about structures. Organisational structures and restructures and the way we organise ourselves at work – how we plan, decide, action… you know, that configuration-y stuff. Partly, this has been sparked by recent work around matrix stuctures, and partly by reading this article on how to build a self-managed organisation. Top down, hierarchy? Matrix working? Self-organised systems? Which is best? Mostly, I suspect, if a group of folk get together and are unable, unwilling or ill-equipped to have the types of discussions, the information sharing, the good will and trust that generates good outcomes and understanding… it sort of doesn’t matter how the hell you organise them. I have some sympathy with top-down hierarchical structures, at times. There is an apparent simplicity and obviousness to the process- I tell: you do – which is tidy and neat. Only… it never really works that way. Not properly and consistently…but I still like the story on occasion – the illusion of control and orderly lines…..
Then I remember the start of my leadership journey, back when my top-down authority extended precisely to the lines in my team….on paper. Off paper, my team did what was needed, irrespective (at times) of my decisions. I’d have been annoyed, but often what they ended up doing was better than anything I was coming up with – that’s when I started to let go a bit, listening properly and asking them stuff… Potentially, I grew up a bit. My reality? Of a role in HR, then L&D/ change? I never had one of those jobs that demanded instant respect… whatever they may be…. If I wanted my authority or opinion to matter beyond my direct reports, I needed to actively build my network, my credibility and my usefulness. Frustrating as this has been, at times, that reality has been.. well, kind of character building. Now I work in a world where any “leadership” I take or show has to be negotiated through others. There is no top-down hierarchy here…and that comes with its own set of stuff. Credibility and respect have to be earned. Collective models for leading and decision making can be bloody time consuming – building relationships, developing the ability to gather views and hold everyone to a core intent; whilst acknowledging that, actually, at some point there will be a series of corridor conversations, email, DM’s etc that support or detract from that core intent… and working to do whatever is required to make the thing happen anyway, surfacing the gnarly bits where you can either through direct action or subtle means…. If you are in a self organising team, or working in a matrix structure, your capacity to lead and influence is awarded or denied by those around you – a constantly shifting morass of opinions and relationships.. no-one is in charge so everyone is in charge, but the authority to be in charge might well depend on your confidence and capacity to talk a good game….that can feel or stressful and actually a little thankless – where do you get recognition if you lead in this model? To “take the lead” or be awarded it through circumstance of expertise, or opinion or function necessitates you are slightly “out there” – apart from others…. yet in a collective structure – you can’t be “out there”leading and also “in here” with everyone… it’s paradoxical and not for the faint hearted. How do we help folk hold that paradox? Being held up as leader, or actively taking the lead and being “out there” means a risk of being misunderstood or maligned – beyond your immediate team or the folk who really know what you are up to. Some times it’s worse…. Sometimes you are venerated and revered… pedestals are, I suspect, precarious. For me, this is the stuff we need to think about and design learning interventions for – how to work with uncertainty and hold your authority in a unstable operating environment. So what am I saying? for me, however we structure ourselves to plan, organise or act, it always comes down to the core stuff –, the need to build relationships– to develop and maintain our abilities to listen, to articulate our viewpoint (kindly, if possible), to work to remain open-minded. It’s about striving to develop our maturity, our capacity to work with uncertainty and our commitment to have positive intent to those around us. This is not about structure, or technology or revolution or disruption. This is about committing to developing the core skills we already have to relate and committing to designing Learning Interventions in our organisations that deeply support that for the long term. So having tried a little Wild Writing recently, I wanted to know more. I bought Natalie Goldberg’s book and have been trying some of the exercises and experiments. It’s bloody hard!!!! And I’m slightly laughing to myself, because the tough-ness of it has come as a surprise. This week I had the deep joy of watching Stephanie Davies, Founder of Laughology do her thing with a group of managers in Manchester. I’m only beginning to get to know Steph – she has been generous in the extreme with sharing her knowledge, her stuff and her experiences – and I hope we get to do pretty much any kind of work together in the future…not just because she properly makes me laugh, but also because there is some real potency to the work she does… Steph was, in her time, a stand up comedian, with all the knocks and the bravery that it takes to stand up in public and be funny (which is, by the way, my idea of HELL) Subsequently, she undertook a deep-dive into researching and understanding the psychology behind humour, happiness and motivation. Her workshops are based on deep cognitive and behavioural models to help other folk understand and develop themselves…. you can learn to be more humorous, more happy and you can understand motivation, make choices differently and grow, personally, professionally, socially, cognatively..… Steph takes the business of happiness and humour very seriously …it’s good stuff. What we talked about that resonated deeply is the notion of the need to have some Grit. Grit is the thing – the tenacious, determined, Bugger-That-Didn’t-work-what-if-I-tried-this-instead-not-bloody-giving-up thing – the sort of secret sauce in the seeming ease and effortlessness of mastery. She talks of finding the joy in struggle. That giving up can feel good… but pushing on and pushing through leads to someplace… potentially even better… (and of course, there is a place for both persistence and for yielding – I’m an advocate of NOT just banging your head off brick walls repeatedly for no reward – that’s not the joy of struggle – that’s the route to madness). A large part of developing oneself is about practice (look also at Carol Dweck’s work on Mindset , Angela Duckworth’s work on Grit , Matthew Syed’s work on Continuous Improvement or Malcolm Gladwell’s 10,000 hours of deliberate practice, ). Through practice, through trying different things, different variants, through trial and error, experiment and fail, we develop – our thinking, our actions, our maturity, our resilience, our tolerance. 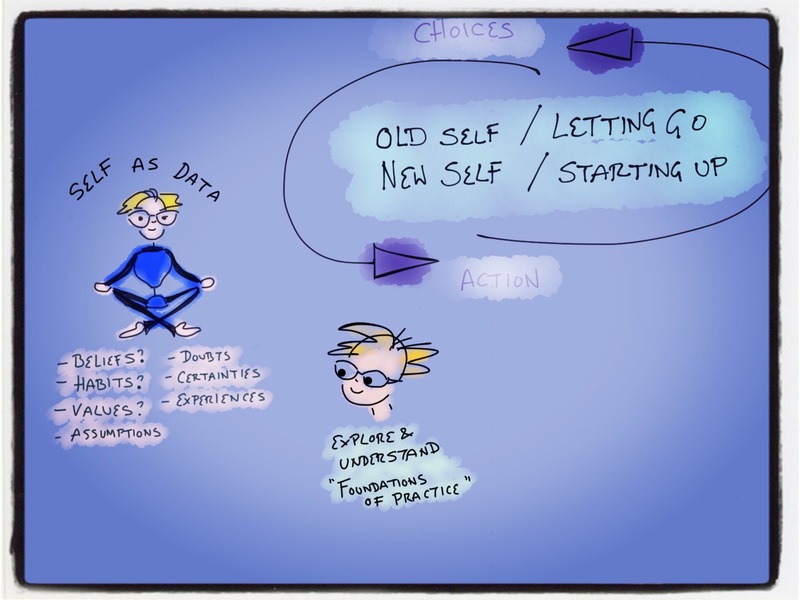 Interestingly enough we don’t just learn new, we also let go of old stuff that’s not working for us anymore – synapses in the brain that are unused kind of atrophy and die – making space for new synapses at any given point in your life. So it is as I find myself in struggle with writing wild practice and the exercises Goldberg suggests.. as I face a sense of failure and frustration when the silences and word-flow stops, as my synapses reach toward each other and mostly fail to grasp each other – I’m beginning to understand that this is the discipline that will take my writing to a different place. When I feel myself unsure and stuttering – clumsy and bambi-legged – here is the edge of my competence and control – can I push on? If I just keep going, keep paying attention, keep on experimenting with different tones and words and structures and rhythms and exercises – I know I’ll find myself in a different place… ah well – back to the notebook. I know I’m learning. I can grit my teeth and find joy in the struggle… ish. NB: I find I’m reluctant to share some of the wild writing here on the blog – all sorts of interesting learning right there about public/ private/ persona stuff. And so I especially want to thank everyone who sent me their Wild Writing, following the last blog – your courage in sharing, your trust and your insights have me humbled.